ST. LOUIS COUNTY- Bayer’s integration of St. Louis County-based Monsanto is underway. 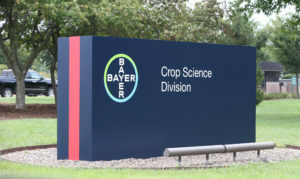 Bayer executives held a breakfast meeting Wednesday morning with reporters in the Gateway City, to discuss Bayer’s goals there. Bayer crop science division president Liam Condon was asked if there will be layoffs. Condon tells Missourinet St. Louis contributor Jill Enders that it’s too early to talk about specifics of St. Louis area jobs. The employees transferring to St. Louis will be coming from North Carolina and Germany. Condon says the new company brings together a state-of-the-art technology platform and the best talent in the agricultural space. He predicts it will benefit farmers, consumers and the planet, citing an emphasis on sustainability. Bayer, which is based in Germany, closed its $63 billion acquisition of Monsanto in June. Bayer crop science division chief operating officer Brett Begemann tells reporters that farmers should expect no changes. Bayer was given the green light last week to begin integrating Monsanto after completing the required sale of some of its crop science business. Mr. Baumann notes unexpectedly high inventories in the crop science division in Brazil.